For me, there are many things that evoke a sense of summer, and whilst they’re not all connected with food, many of them are. This includes picnics and barbecues, strawberries and cream, birthday cake, summer pudding, fish and chips, and home-grown tomatoes. It also includes the simple pleasure of shelling and eating fresh peas, and I’m sure that all of these are general experiences shared by many. In my case, the association between summer and fresh peas is linked to a particular and very distinct childhood memory. I’m six years old, and sitting on the step immediately outside the back door. It’s a gloriously hot and still day in the height of summer, and my mother is in the kitchen behind me making dinner. I’m helping her by shelling pods of peas, and I’m popping them into a stainless steel colander that is on the ground next to me, reflecting the bright light of summer as it catches the sun. It’s a very simple memory – and one that has almost certainly been romanticized over the years – but it nevertheless remains remarkably intense. 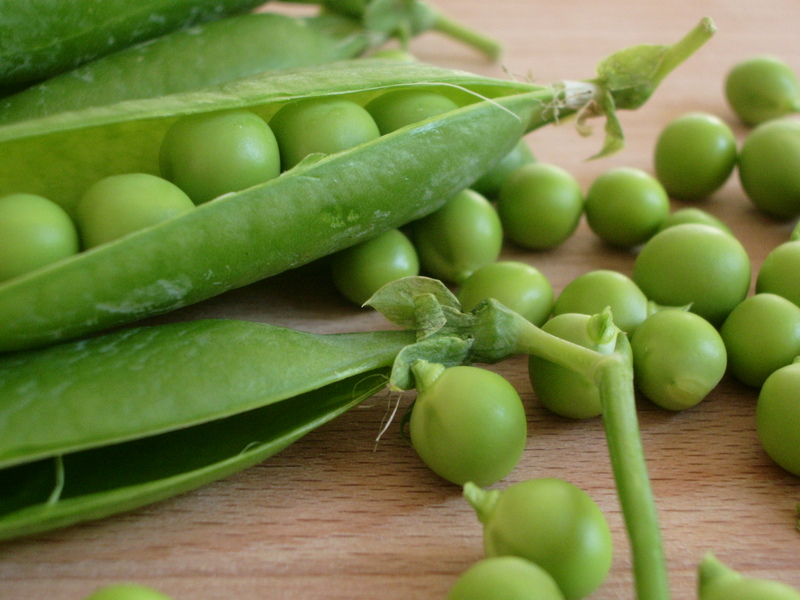 So much so, that every year without fail, fresh peas burst into my consciousness right at the beginning of the summer – in the earliest days of June. As far as I’m concerned, they even look like summer, decorated in that perfect shade of brilliant green reserved for only the freshest and most vibrant of growth. And it feels like summer every time I pop fresh peas from their pod and eat them raw; standing in the kitchen and devouring them long before they stand a chance of making it to either the colander or the plate. But I love them in salads too. And it’s a real treat to cook with them, although it’s absolutely imperative not to over-cook them. Simmering until just tender retains all their delightful flavour as well as that powerful colour. This recipe comes from my sister, who is not only a wonderful cook but also a terrific gardener (as you can see from the photograph above), and who – at the far end of her stunning garden – successfully grows an impressive range of fruits and vegetables that I both admire and envy. I always love visiting her, but I particularly enjoy going in the summer when she makes incredible, mouth-watering salads, consisting of the freshest of ingredients picked from her garden just moments before. They are – quite seriously – among the nicest things I have ever eaten. But this recipe is an old favourite as well, sent to me by my sister many years ago now. It’s a soup that’s great in winter, but really is lovely in the warmer summer months as well. It’s surprisingly light, and characterised by fresh flavours that are incredibly intense. And as with many soups, it’s quick and easy to make, as well as being a versatile dish, great for lunch or even as a light supper. Heat the olive oil over a medium-high heat in a large saucepan. Add the leeks and potatoes, and cook for about five minutes. Add the garlic and give everything a good stir. Turn the heat down to medium-low, cover and cook for another 10 minutes, until the leeks have softened. Add the stock, increase the heat and bring to the boil. Reduce the heat, cover again and simmer for about 10 minutes. Add the fresh peas and most of the chopped mint. Simmer for a just a couple of minutes. If you’re using fresh peas, then you really don’t want to overdo them. The idea is to keep them beautifully bright green and relatively firm. Season to taste and serve garnished with the leftover mint, and grated cheese (if using). This entry was posted in Food, Lunch, Recipes, Seasonal, Soup, Starter and tagged Jersey royals, Leeks, mint, new potatoes, peas, summer vegetables. Bookmark the permalink. Oh no! It’s just so tempting, isn’t it! I like adding a few chopped mint leaves to peas but never tried it in a soup before. Sounds great! Peas and mint are a really great combination, and it does make a wonderful soup. It’s so pretty, isn’t it? And I agree, peas are just delicious! A lovely fresh soup! I agree here, with fresh peas only! MMMMMMM! It really does taste better with fresh peas, but I do end-up making it with frozen ones most of the time and it’s still pretty good! I love this kind of summer soup. So fresh! Absolutely. The peas and mint make it really light and refreshing, but the potatoes mean that it’s substantial enough for a light meal. You sister’s garden is stunning! It’s really beautiful, isn’t it? And absolutely all her own hard work – it was a completely blank canvas when she moved in there, and she’s constantly developing it as well. what a great recipe. i will try this. your peas are too beautiful! Thanks Danny. I really hope you enjoy it. It’s so cold here right now, I would love some of this! It’s very easy to make, and I’m sure that it could help to warm you up! Wonderful photos – can’t wait to try this soup! 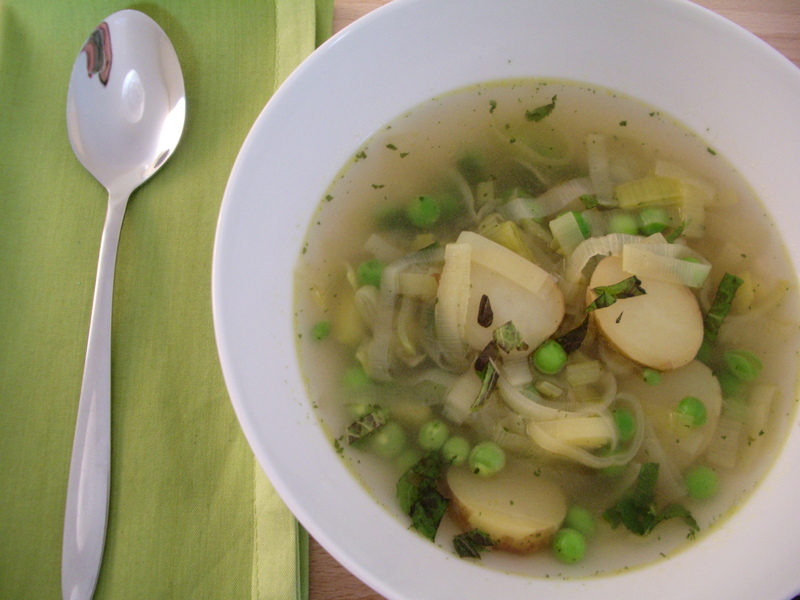 I adore this soup – and it’s great in summer as well as winter. I hope that you enjoy it! This soup is a classic of my summers. Peas and mint are a perfect combo, fresh and delicious!! It really is the most fabulous combination, isn’t it? I’m glad that it’s a favourite of yours too. 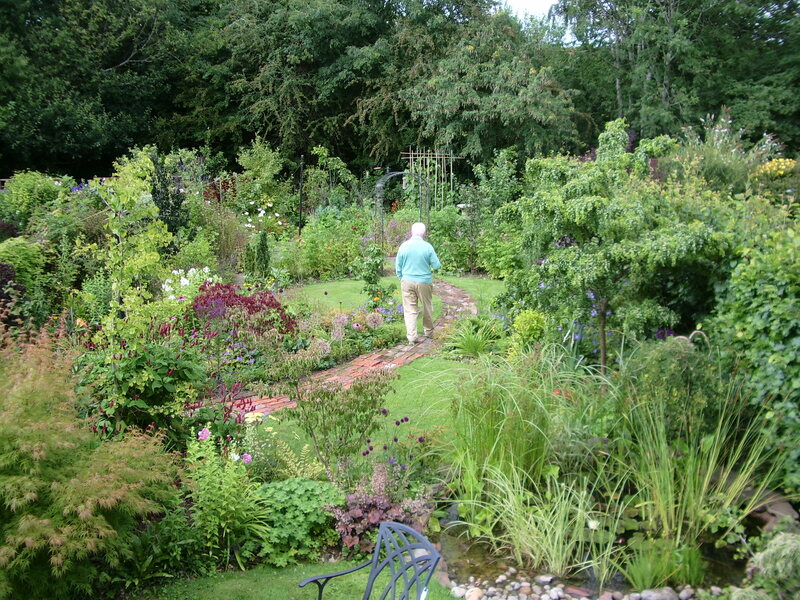 I can’t believe how the garden has grown since this photo, Dad looks great too! Thank you for your kind words – everyone. Fond childhood memories. It really does look different, doesn’t it? …Still full of wonderful produce though! And I love that Dad is in this picture too.